As abstract game month here at The Thoughtful Gamer spills into February for a bit, I have to admit that I’ve fallen more and more in love with the abstract game aesthetic. I enjoyed it before–particularly the black and white and bamboo styling of Go–but now that I’ve immersed myself into some other abstracts over the past few weeks I understand that appreciation on a different level. Sitting down to a game of Go or Chess or Tak is at once imposing and inherently optimistic. You know that there’s nowhere to hide because every part of the game is out in the open. Only skill will determine the victor. But you also know that perhaps, one day, you’ll stumble upon a great move and do something genuinely impressive. It’s that optimism that keeps me coming back to the abstract. I’ve never done it, but like the tagline of a cheesy made-for-TV movie, I know the power is within me to make a singular good play. I cannot overstate how bad I am at abstract games, but I keep coming back to that aesthetic. I think the stately, academic look fits with the kind of person I delude myself into thinking I am–the man who thought his path was heading towards becoming a philosophy professor instead of the guy who just spilled leftover nacho cheese on his shirt. 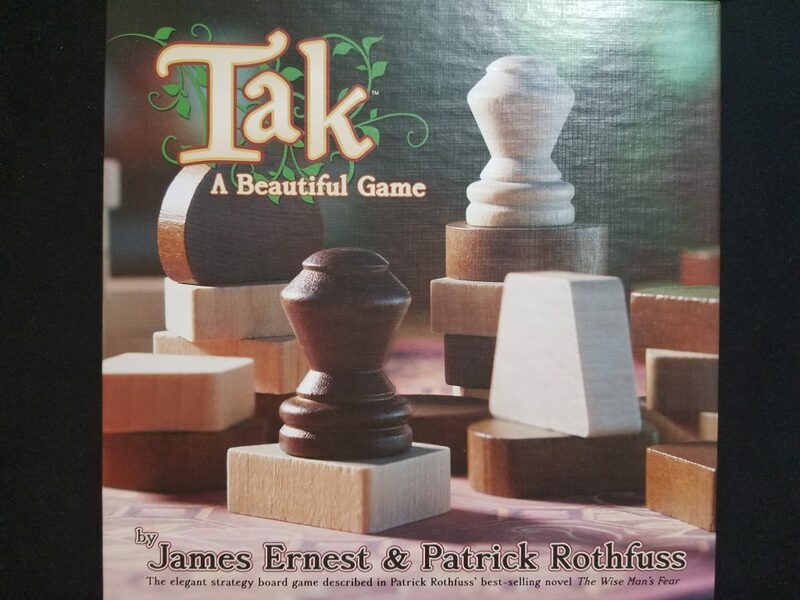 Tak, the 2017 release from James Ernest and Patrick Rothfuss, based on the later’s description of a fictional game in his novel “Wise Man’s Fear”, is something of a minor miracle. The book was vague on the details, but described almost an idealized game, “simple in its rules, complex in its strategy” and I assumed that any efforts to create that game would inevitably fail. Remarkably, it works. Ernest and Rothfuss have managed to make a game that feels old. It’s even got weird artifacts that you would expect from a game born from tradition, like a rule for who wins if the game effectively stalls, and a first turn rule I don’t quite understand where you place your opponent’s piece instead of your own. The look and feel of the game is perfect, especially if you’re a fan of Rothfuss’ world. The goal of the game is to construct a path from one side of the board to the other. The pieces are called flat stones, standing stones, and capstones. The copy I’ve been playing with has one side adorned with Selas flowers and the other with a basic wooden print (the “tavern board”). Everything is so very in tune with the Kingkiller Chronicles, and I love it. For those who haven’t read the books–you should–but you ought to know that roads and standing stones in particular are very important to the story and that Rothfuss is exactly the kind of person who would relish being able to choose between something that belongs in a tavern and a board adorned with the very special to the story Selas flower. Indeed, he’s worked with Wyrmwood to make incredibly expensive and luxurious Tak sets for the truly dedicated. They look incredible, but I don’t think my self-delusion extends that far. But when you tag your game “A Beautiful Game” that can’t just extend to the pieces. It’s a bold claim, and there’s no way on earth I’d ever be sold bold with one of my own designs. Is it beautiful? In a way. 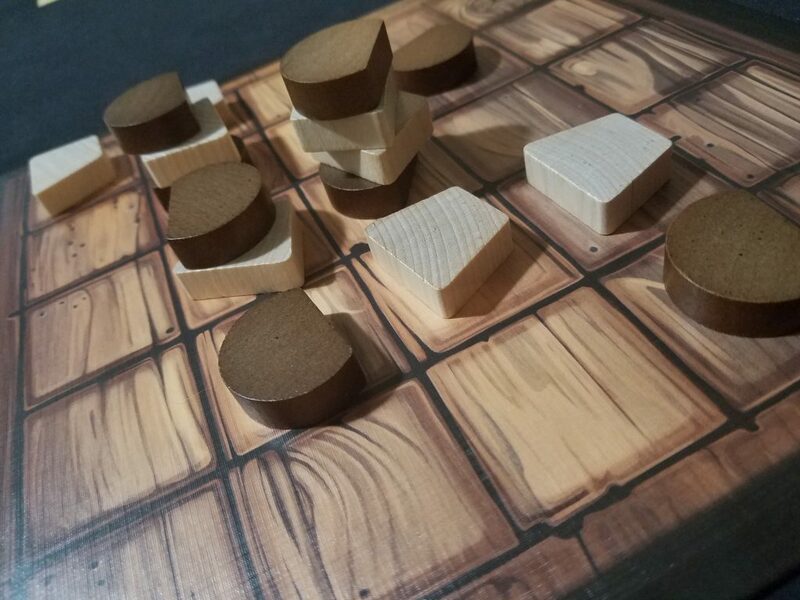 I don’t think Tak is perfect, but there are enough intriguing ideas to make me want to keep playing. Each turn you can either place a piece or move it, an inherently intriguing premise. You’d think that placing a piece would be more significant, given that you’re trying to construct a road, but quickly you’ll realize how important movement is in a game of Tak. See, when you move a piece you can stack it on top of another piece, and whoever owns the top piece owns the entire stack. With a stack you can move up to 5 pieces from that stack in a single direction, dropping off at least one piece at each spot along the way. Stacks are super important. Suppose you had control of a stack with 5 alternating pieces. With one move you could turn that stack into a row of 3 spaces, all controlled by you. Of course, while a stack’s height may impact how much potential damage it can do, it doesn’t mean anything about that stack’s defenses. A single opposing stone can simply hop up and take over the entire thing. Now you’re not only trying to acquire stacks, but protect them. When you look at the board, you’re starting to see which stacks you can hold, rather than just the stacks you can take. Every orthogonally adjacent space is control, and you’ve got to leverage that control to try to get an edge over your opponent. So the stacks keep getting bigger and bigger until a tipping point is reached and someone can de-stack into a victory, right? Kind of. The second kind of piece is a standing stone (or walls, according to the rule’s fake colloquialism), which is simply the normal piece standing on its edge. Walls can’t be stacked upon, making them sturdy barriers, but they also don’t count as part of your road, making them purely defensive pieces. The final piece, of which there is only one for each side, is the capstone. It’s the best piece in the game because it functions as a wall that also can be part of your road. Perhaps more importantly, the capstone can flatten walls if it stomps on them. All three pieces are important for different reasons, and all three will need to be used to secure a victory. Walls can be especially important because in one move they can stall a plan in its tracks. But too many walls can lead to a stalled game where the board fills up, and in that case, whoever controls the most flat stones wins the game, making walls a liability. This end game doesn’t feel nearly as satisfying, but it’s necessary to balance the effectiveness of the walls. 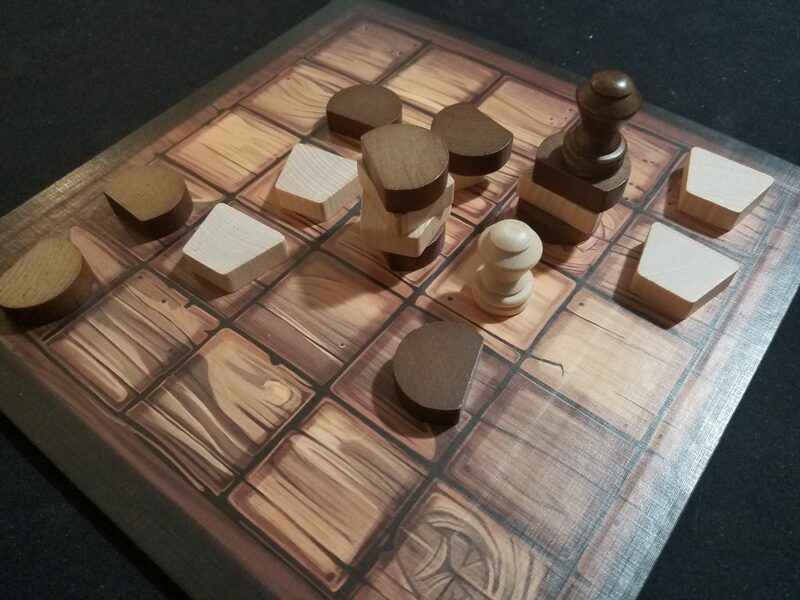 Tak has all of the parts of an abstract game that you want–perfect information, an attractive look, and enough lines of play to justify long stretches staring at the board trying to find the right move. There were plenty of “hmmm”s and contemplative beard-strokings in my plays of Tak, and if that’s not the sign of a good Friday night, I don’t know what is. Tak overcomes the initial barriers to being a great abstract game, but I’m not sure how well it does in the more advanced metrics. The first player advantage could be a significant issue. I’ve seen numbers ranging from a 55-65% win percentage for the first player, which ranges from probably okay to very concerning. For comparison, the first player advantage in chess is around 53-55%. In Go, the first player advantage is estimated to be about 6-7 points, though in that game it can be easily neutralized through a handicapping system. Tak and Chess have the more difficult problem, as there’s no clear way to balance against it for tournament play. Will that affect my casual play? Probably not, but it’s annoying to know that it’s there. I find the board state significantly easier to recognize in Tak than in Chess or Go. Will that make the game less interesting to me over time? Will that make broad interest in the game fade? I don’t know the answers to those questions, but of all of the new abstract games I’ve played the past month Tak is the most likely one to stick around for a while.